It is a sumptuous wine, masculine, with a pronounced personality, well worth keeping 3 years minimum. 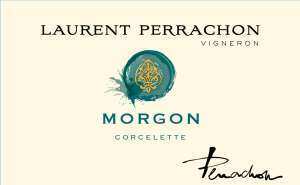 Parker gave the note of 88/100 to our Morgon Les Versauds, and 89/100 for the Morgon Domaine des Perelles. See also the outstanding Morgon "Côte du Py" , our other Morgon. The best parcel in Morgon, at the footsteps of the Côte du Py hill. The grapes harvested here are very representative of the best this appellation can offer. The grapes are harvested on a 42 acres parcel with a very pebbly soil, schistous, iron oxide rich, typical of this appellation. It gives a bright purple-hued wine that we mature in oak barrels. Its typical aromas of kirsh with peppery notes are well blended with animal notes. During fermentation, we allow the wine to macerate 12 to 14 days to extract all its potential. Then the wine is matured in oak barrels for 12 months. Ideal for rich meals, with complex flavors, like duck with peaches. Raised in oak barrels for about 12 months plus 3 months in large oak vats.